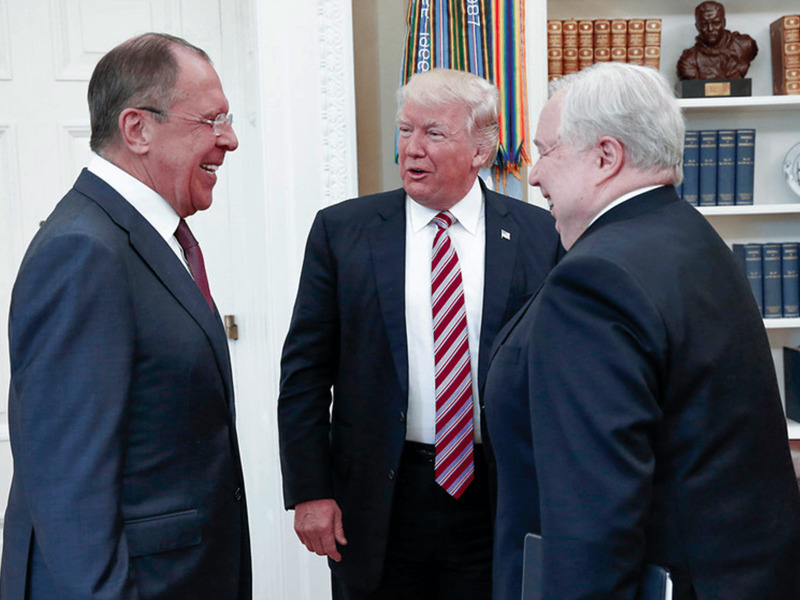 The photo is from the Oval Office during a meeting our President held the day after he fired the FBI Director because of the ongoing investigation into connections between the Trump campaign and Russia. It was at this meeting that Trump disclosed high-level classified information to our long-time global antagonist that compromised seriously a source of intelligence, according to The Washington Post. The White House, of course, denied the report, sending out the once-credible NSA Advisor, H.R. McMaster, to deliver a response parsed so carefully that it would have made Bill Clinton – “it depends on what the meaning of “is” is – blush. Trump, of course, cut McMaster’s legs out from him by tweeting (of course) that he gave important facts to the Russians out of humanitarian (sic) concerns. Now we have Vladimir Putin, formerly of the KGB, offering a transcript of the meeting to support the President’s position, whatever it is. Now, if there truly was collusion between Trump and Putin, Putin would have been smart enough to realize that his endorsement would not only carry no weight in the US, but would indeed have been detrimental. And if Trump had a sentient advisor that he listened to, he would have been told the same thing. If you get your information from the Washington Post or NY Times then you are a very poor blogger. These papers are nothing more than Democratic Pawns. Let me know the next time one of these papers reports a fact that turns out to be inaccurate.